Subcutaneous (SC) delivery of bortezomib (BTZ) has been shown non-inferior to intravenous (IV) delivery in terms of efficacy while offering improved safety (Moreau, et al. Lancet Oncol 2011;12:431-40). The phase 3 ENDEAVOR study demonstrated a significant improvement in progression-free survival (PFS) for carfilzomib and dexamethasone (Kd) vs IV/SC BTZ and dexamethasone (Vd) in patients with relapsed or refractory multiple myeloma (RRMM) (Dimopoulos, et al. Lancet Oncol 2016;17:27-38). Currently, most BTZ use in MM is SC, and most relapsed MM patients had prior exposure to BTZ. We present results of a subset analysis of the efficacy and safety of Kd vs SC Vd in the ENDEAVOR study consistent with current standard of care; the effect of prior exposure to BTZ was also investigated. After providing informed consent, patients with RRMM (1-3 lines of therapy) were randomized 1:1 to Kd or Vd. The analysis compared Kd patients who had selected SC BTZ delivery pre-randomization if randomized to Vd arm with Vd patients who used SC BTZ. Kd arm received carfilzomib (30-min IV infusion) on days 1, 2, 8, 9, 15, and 16 (20 mg/m2 on days 1 and 2 of cycle 1; 56 mg/m2 thereafter) and dexamethasone (d) 20 mg on days 1, 2, 8, 9, 15, 16, 22, and 23 of a 28-day cycle. Vd arm received BTZ 1.3 mg/m2 on days 1, 4, 8 and 11 and d (20 mg) on days 1, 2, 4, 5, 8, 9, 11, and 12 of a 21-day cycle. The primary endpoint was PFS. Secondary endpoints included overall survival (OS), overall response rate (ORR), rate of grade ≥2 peripheral neuropathy (PN), and safety. Treatment with Kd led to prolonged progression-free survival vs Vd patients who were administered SC BTZ. The use of Kd also led to higher response rates, a trend for prolonged OS, and lower rate of grade ≥2 PN vs SC Vd. In patients with prior BTZ exposure, Kd treatment resulted in longer PFS, greater ORR, and decreased PN vs SC Vd. 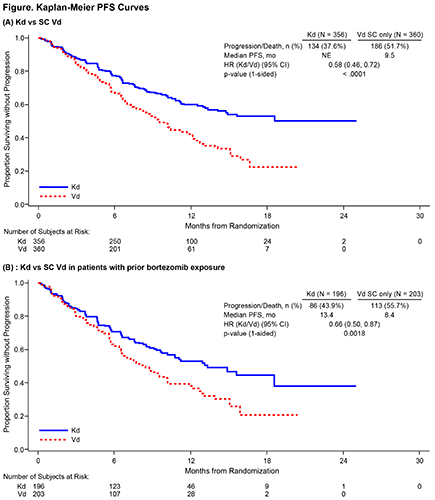 These results suggest that Kd has a favorable benefit-risk profile and delivers superior efficacy and improved clinical outcomes compared with SC Vd for RRMM regardless of prior BTZ treatment.